The 9th annual Rock ON climbing competition was held at UW-Superior in the Marcovich Wellness Center on February 9, 2013. This was the first time UW-Superior joined WICS. WICS stands for Wisconsin Indoor Climbing Series which was established in 2012 with the University of Wisconsin System. This year, UW-Superior was the first of 5 competitions in the 2013 climbing series. The following competitions are held by UW-Oshkosh, UW-Stout, UW-La Crosse and UW-Stevens Point where the format can be a bouldering or a top rope comp. It was the largest competition UW-Superior has held with 64 total competitors. Competitors traveled from Oshkosh, La Crosse, Menominee, Minneapolis, Stevens Point, the Upper Peninsula, as well as from Duluth and Superior. The climbing wall staff worked hard to create 36 total routes rated between 5.5 and 5.13. The competition was intense with only 4 short hours to notch your top 4 scores in the Advanced, Intermediate, or Beginner category. We also had ladder golf, kubb and free pizza and snacks to offer between climbs. We had wonderful sponsors this year where every competitor got a t-shirt and won a prize or even two from Just Ropes, National Bank of Commerce, Smith Optics, Mountain Khakis, Keen, Led Lenser Access Fund, ABEE, Black Diamond, Cliff Bar, Moose Jaw, Vertical Endeavors, Metolius, Boreas, Soill, Midwest Mountaineering, Prana, Alps Mountaineering, Screen Graphics, Barker's Island, Dominos and Mont du Lac Recreation. 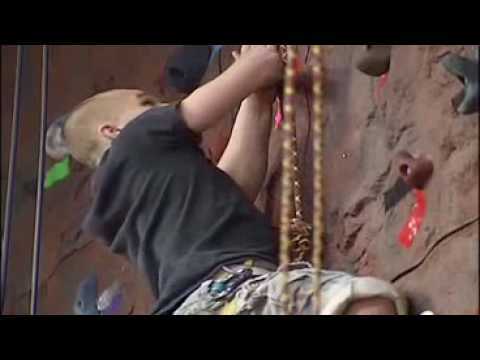 a kids climbing competition and continued into the afternoon with the adult climbing competition. Over 40 different routes were set ranging in difficulty from 5.4 to 5.12d. There were approximately 30 participants many of whom were from the Twin Ports area. "Where it's OK to Put a Crimp in Your Style"
Rock On '09 was another great year for UW Superior's annual Climbing competition. 46 participants turned out to climb 37 new routes. Participants came from UW Stout, UM, CSS, UW-Superior, and the local Duluth/Superior community to compete. The results from 2009 placed Peter Dodge taking men's advanced with James Jaderborg placing first in men's intermediate, and Esantha Seneviratne finishing on top in men's beginner. On the Women's side, the day finished with Randi Crenna in first for women's advanced, followed by Kelly Seawell taking women's intermediate, and Nicole Rochel winning women's beginner. Rock On '07 was a great year for competition. Again the comp grew from the previous year to reach a capacity of 39 participants from Northland College, UMD, St. Scholastica, Lake Superior College, and the surrounding Duluth/Superior area. For this year we had 33 new routes prepared to challenge climbers. One new feature at this year's comp was the slack line that was set up for climbers who were taking a break from climbing. After 4 hours of intense climbing the results were as follows. For women's advanced Alex Eck claimed victory, for women's intermediate Christina Frost took first, and for women's beginner Amanda Robnik came out on top. In the men's advanced Tyler Overby claimed victory, men's intermediate saw Curt Sahli come out on top, and men's beginner finished with Philip Tergerson in first. Rock On '06 was our second year for our annual climbing comp. Participation grew from the previous year. Due to the increase in participation more routes were introduced. For this year we had 28 all new routes for climbers to test their skills against. Another element that was introduced this year was the post comp challenge of the "Toe Hang." A fun challenge where climbers suspend themselves upside down by their toes and are timed to see how long they can hold themselves up, they are tied in for safety of course. Rock On '05 was the debut of UW Superior's annual climbing competition. It was held on the first Saturday in April, April 2nd that year. The brand new wall was outfitted with 22 routes for climbers to try out. There was a good turnout and 2005 turned out to be an excellent start to tradition of fun climbing competitions.